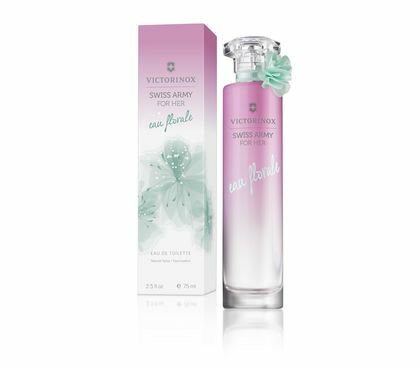 Victorinox Swiss Army For Her Eau Florale is a crisp and joyful fragrance with its fresh top notes, floral accords and woody base notes. Uplifting and contemporary, both the scent as well as its functional yet feminine flacon are the ideal companion for the woman of today and her everyday adventures. From the top notes, Eau Florale unveils sparkling and joyful scents. A floral bouquet starring peony, jasmine and violet at the heart, tinted with green and natural fruity accents at the image of a lovely young woman walking around a middle of a flower field. A cocktail of colorful and juicy facets of mandarin and grapefruit laces with hints of peach and blackcurrant for a luminous and luscious depart. This floral and fruity fragrance evokes the relaxing feeling of a precious and carefree moment. Eau Florale reveals a woody and sensual dry down of cashmeran and cedarwood, wrapped in comfortable musks for a unique signature. Made for the modern playful woman, our new Eau Florale fragrance is crisp and fresh. Watch the movie as it brings this fragrance to life, following the Eau Florale woman as she explores a world infused with brightness and joy.